If you are using e.g. Joom!fish component on your site, then there are three locations where you can change the parameters. You can change the parameters in translated menu links in Joom!fish too. Parameters Components override Global Configuration parameters. Let's assume that you want to install a component to display e.g. a square in your choice of color on your Joomla! 1.5 site (This is only an example component, but the behaviour is valid for all Joomla components). You want the square to be blue. So you set the blue color for this component in the component's Global Configuration. If you create a menu link to this component, when the user clicks on this link, he will get your blue square. What happens if you want to create two menu links to the same component and you want the first link to display a green square and the second link to display a red square? The URL parameter Itemid used in Joomla! 1.5 identifies the menu link on your site and refers this menu link to the Parameters Component. By using the Parameters Component you can set different values for different menu links and in this example you can have different menu links referring to one component. The Parameters Component overrides the Global configuration for a specific menu link. If you want to use the parameters from the Global configuration, you can select the 'Use Global' value in the Parameters Component for every parameter. Obviously then the Global Configuration's parameters will be not overridden by the Parameters Component's parameters, so in our example, the blue square would be displayed. But be aware, there is one exception. If the Parameter Component's parameter is saved in Input form 'Text' or 'Text Area' (and not as Input form 'Select box' or 'Radio Button'), you will not be able to use the 'Use Global' value. In this case, the Parameter Component's parameter will override the Global Configuration's parameter every time. So where our component uses Input form 'Text' for setting a color and you set e.g. '#3333cc' (blue) in Global configuration and e.g. ‘#fc0000’ (red) in Parameters Component, you always get the red square in your component. This is important to remember if you have been trying out different color schemes and decide make 'Global' changes. You will have to go back to each Menu's Parameter and change the color manually. Phoca extensions are using a small hack. It means if you leave the field blank in Parameters component, then the Global Configuration's parameter will be used. This behaviour is different to other Joomla! 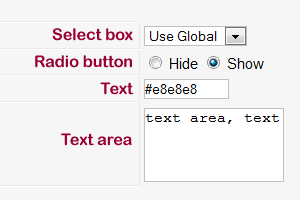 components and allows you to make "use global" working for Text and Text area input fields.